Sermon on Genesis 45:1-15 offered to the people of the Church of the Heavenly Rest in Abilene, TX. Audio for this sermon can be found here. When Sarah Beth and I arrived in Texas three years ago, we knew that life would be very different than it was where we came from. Nothing, however, could prepare us for the Texas phenomenon that is Dairy Queen. Within the first few days of our arrival, we started to notice commercials that included the jingle: “DQ: that’s what I like about Texas.” This was surprising to us. 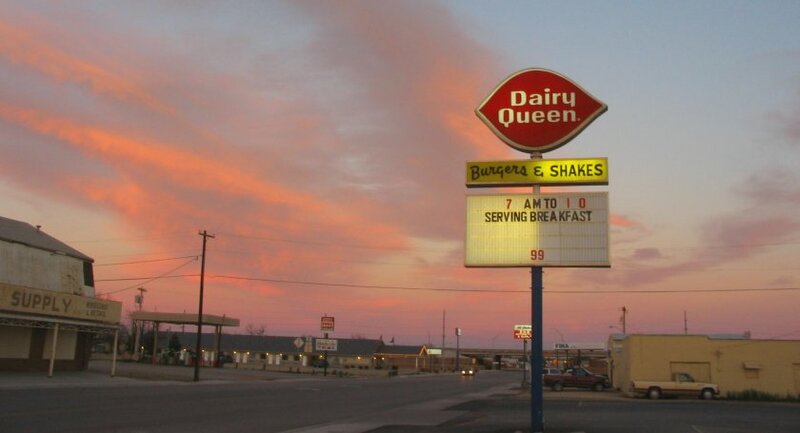 After all, we have Dairy Queens where we come from; the notion that Texas had a cultural monopoly on the fast food chain seemed a little bizarre. But we gradually came to realize that there is a reason that Texans like to call Dairy Queens “Texas stop signs.” Where we grew up, you could generally assume that you would only find Dairy Queens in communities large enough to support a restaurant. Around here, there are towns without traffic signals and with populations that consist primarily of cattle that boast outposts of the ubiquitous franchise. Eventually, I came to appreciate the unique position that Dairy Queen has in the cultural (and physical) landscape of Texas. You might even say it became one of the things that I liked about Texas. I mention all of this because I have come to like, even love this strange land that is so different from where I grew up. I mention all of this, because this place with its funny place names and strange attitudes about the weather has become home. Today we hear the story of someone else who has found home in a strange place. We’re all familiar with the story of Joseph. He was beloved by his father Jacob, who showed Joseph such preferential treatment that his brothers jealously sold him into slavery. Joseph ended up in Egypt, where he used his ability to interpret dreams to impress those who had power over him. Eventually, he became a councilor to Pharaoh after accurately predicting a worldwide famine and advising the Egyptian ruler to prepare accordingly. As a result of this preparation, Egypt becomes the only place in the region where food is readily available, which brings Joseph’s hungry brothers from the land of Canaan. When they arrive in Egypt to purchase food, they are brought before Joseph, but no longer recognize him now that he is clothed with power instead of the coat with long sleeves. Ironically, Joseph now has power over the same men who once threw him into a pit and sold him into slavery. And we see Joseph wrestling with whether he should use this power to exact revenge on his brothers for their duplicity. He hides his identity from them and toys with his brothers, accusing them of being spies and insisting that they bring little Benjamin, whom they had left to tend the meager flocks in Canaan, down to Egypt. Eventually, however, we arrive at the story we heard today, when the writer of Genesis tells us that Joseph “could no longer control himself” and reveals his true identity to his brothers. Before they are overwhelmed with the guilt that has been festering for years, before they can even apologize, Joseph forgives his brothers and tells them not to be distressed. He forgives them because of what he has been able to accomplish in Egypt, because of the lives has saved and the hungry people he has fed. Joseph tells his brothers that God has used their malicious intent to make a positive impact on the world. Indeed, Joseph makes this abundantly clear when he tells his brothers, “It was not you who sent me here, but God.” Joseph was able to look back on his experience of being a stranger in a strange place and understand that God had called him to be there. There are times in all of our lives when we find ourselves in strange places. We are in a strange place when a new child comes into our life. We are in a strange place when we face health challenges we have not experienced before. We are in a strange place when we move from the comforts of our parents’ house into a freshman dorm. We are in a strange place when we lose a spouse to divorce or death. And of course, we are in a strange place when we start a new job in a new place, miles from home and family. There are two options we have when we are in these strange places. On one hand, we can close our eyes to reality and pretend that these strange things are not happening to us. On the other hand, we can open ourselves to possibility and see our time in these strange places as opportunities: opportunities to grow, to do good, to learn something about ourselves. 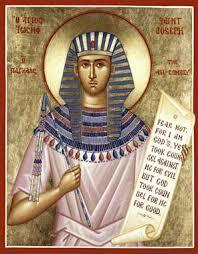 This is what Joseph did in Egypt, and it is what we have tried to do here in Abilene. With your help, your guidance, and your love, Sarah Beth and I have grown as a couple and a family, tried to do good as leaders in the Church, and learned how to be Texans. Now, the sometimes painful reality is that we are never in these strange places forever. Notice what Joseph instructs his brothers to tell their father: “You shall settle in the land of Goshen, and you shall be near me, you and your children and your children’s children, as well as your flocks, your herds, and all that you have. I will provide for you there.” This must have been a source of incredible relief and comfort to Jacob in his old age. Throughout the book of Genesis, we have followed this family on their long journey toward the land God promised to them. They have been nomads and refugees with no place to call their own. All of the significant moments of Genesis take place on the road. And here, Joseph seems to announce that his family’s long journey has finally come to an end, that his brothers and their descendants will have place to call their own in the land of Egypt. We all know, however, that this does not end up being true. After all, the defining event in the life of the Jewish people, in the life of Joseph’s descendants is the Exodus, the escape from Egypt, the continuation of that long journey begun when Abraham set out from Ur into an unknown future. Joseph himself recognized that his family would not be in Goshen forever. Before his death at the very end of Genesis, Joseph instructs his children to carry his bones with them when God eventually calls them to leave the land of Egypt. The heritage of our faith is built not on permanence, but on transition. Our faith teaches that we will never be in one place forever, that we are on a journey, moving toward what God has promised to God’s people. Sarah Beth and I are in touch with this bittersweet reality right now. As we prepare to say goodbye to Abilene and to the Church of the Heavenly Rest, we are aware how truly wonderful this strange little place is. As one outsider has put it, Abilene is remarkable place, not because it has mountains (it barely has hills) and not because it has the ocean (it barely has water). Rather, Abilene is special because of the quality of her people. This particularly true of the people of Heavenly Rest. This is a place that is a sign of the transcendent, a place whose architecture, music, and liturgy radiate beauty in a world that is hungry for it. This is a place that cares for those who are vulnerable by feeding them, clothing them, and telling them that they are loved. Above all, this is a place that makes people feel that they have come home, whether they are from Texas, the Democratic Republic of Congo, or even Connecticut. In just a little while, we will gather at that altar, that altar which includes stone from Mount Sinai and Solomon’s Temple, stones that remind us that our faith is not limited to one place, that we are in communion with God and with one another wherever we may go. As we gather at that altar to celebrate what God has done for us in Jesus Christ, we will be celebrating, not only with those who are gathered here this morning, but also with those who are gathered around Eucharistic tables around the world, from Abilene to Canterbury to Lubumbashi to Pennsylvania. We will be celebrating not only with those who are still with us, but with all those who have gone before us, from Willis Gerhart to Conrad Bratton. Every time we gather around the Eucharistic table, we are at that table with everyone who has come to know and everyone who will come to know the abundant love of God made known to us in Christ Jesus. As we go through our lives of journey and transition, it is at the Eucharistic table that we find our true home, the place where we are in true communion with God and one another, the place that is a foretaste of that great family reunion, the banquet prepared from the foundation of the world in the creation that will finally be renewed by the death and resurrection of Jesus Christ. We love you and will miss all of you dearly. In the meantime, we are confident that we will always have a place to call home here in Abilene, and ultimately, that’s what I like about Texas.